Portrait of a Hero of the Soviet Union guards major Nicholas Pinchuk. Nicholas G. Pinchuk – the commander of the 1st Squadron of the 18th Guards Fighter Aviation Regiment (303 th Fighter Division, the 1st Air frmiya, 3rd Belorussian Front). August 30, 1943 near the town of Yelnya Nicholas Pinchuk was injured after ramming a German dive-bombers Ju-87. He was sent to the hospital for treatment, but on the way ran into the rear of his regiment, and after a month had already been back in combat formation. 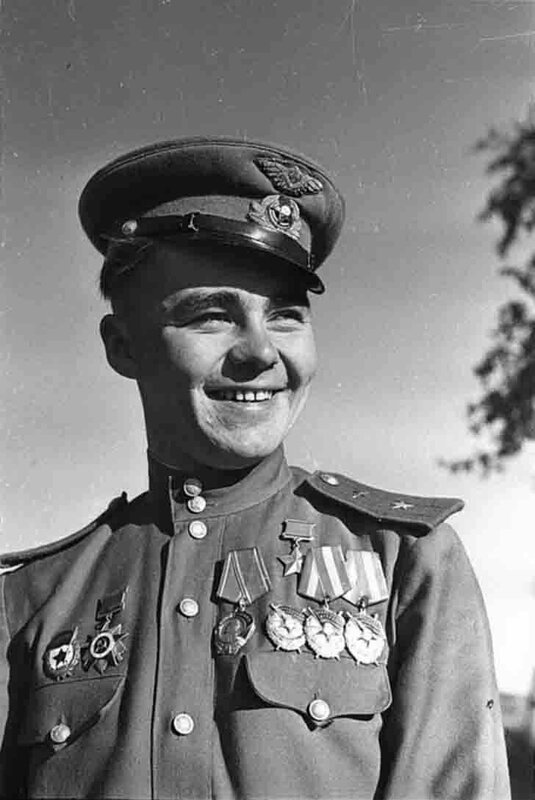 Hero of the Soviet Union Nikolai Pinchuk awarded April 19, 1945 for 226 combat sorties, 46 air battles and shot down 18 enemy aircraft and for displaying courage and high flying skills. In total during the war, Nicholas Pinchuk has made 307 sorties, participated in 68 air battles, shot down 24 enemy aircraft – 22 person (one aircraft shot down a ramming attack) and 2 in the group.